A healthy diet with fresh, wholesome ingredients paves the way for optimum health. But sometimes, for a variety of reasons, you may also need additional support in the form of health supplements to get essential nutrients, to correct nutritional deficiencies and to improve your health. But do these supplements really work? You can absorb only a certain amount of the nutrients and micronutrients you get from your food and supplements. For instance, resveratrol and curcumin supplements offer incredible health benefits, but they are limited by their poor absorption and low bioavailability. Glutathione is one of the most important antioxidants your body makes on its own, but its production declines with age. So, taking it in supplement form seems to be the most logical way to maintain healthy levels to help your body maintain its anti-oxidant status. However, normal oral supplements are ineffective in improving glutathione levels in the blood, as most of it is degraded during digestion. Vitamins, minerals and antioxidants must reach target cells and tissues to offer desired health benefits. That is why it is important to choose your supplement in a form that improves the absorption of nutrients, making them more available to your cells. This brings us to liposomal supplements which promise higher absorption and bioavailability than your typical oral supplements. So, what are these liposomal supplements? Let us first discuss what liposomes are and why these structures work as excellent carriers to deliver vitamins, nutrients and other agents directly to the cells and tissues in your body. The word ‘liposome’ comes from two Greek words: ‘Lipos’, which means fat and ‘Soma’, which means body. Liposomes are small-sized vesicles made of phospholipids, a class of fats that are the main structural component of your cell membranes. A liposome has a very interesting structure with a hollow core enclosed by a phospholipid bi-layer. It’s this double layer structure that makes liposomes a highly effective vehicle to carry drugs and nutrients – delivering them directly into the bloodstream and to your cells. A phospholipid molecule consists of a head and a tail which are joined together by a glycerol molecule. The head is made of phosphate group whereas the tail has two long chains of fatty acids. The tail, consisting of fatty acid chains, is hydrophobic in nature, meaning it is repelled by water. On the other hand the head, made of phosphate group is hydrophilic, meaning it loves water. The magic happens when phospholipids are dispersed in water or an aqueous solution. These molecules automatically arrange themselves in a unique way. The water-hating lipid tail moves away from the water and the water loving phosphate head moves towards the water surface. This orientation results in the formation of sealed, spherical structures that have a hollow core surrounded by a double layer-membrane. These vesicles or bubbles are called liposomes. Taking vitamins and mineral enriched supplements doesn’t guarantee you are getting all the necessary nutrients you need. To understand why, let’s first go over an important factor called bioavailability. For a supplement to have the desired outcome, it must be properly digested and transported into the circulatory system. Bioavailability is the degree to which nutrients from food and supplements become available in your tissues and bloodstream for ready absorption after they are digested. Not every vitamin, mineral or drug has the same bio-availability. Some are quickly and easily absorbed, others might need additional help whereas some are not fully absorbed. People over 60 have trouble absorbing most nutrients, especially vitamin B12 and magnesium. Conditions such as Crohn’s, celiac disease and irritable bowel syndrome (IBS) affect the absorption of nutrients (obtained through food or supplements) by the body. Drugs which are used to treat acidity and heartburn (for example, proton pump inhibitors) can limit the absorption of vitamin B12 as well as minerals such as magnesium and iron. Metformin, a commonly used anti-diabetic drug, also interferes with the absorption of vitamin B12, causing B12 deficiency. Similarly, antibiotics destroy good bacteria in the gut along with bad. Since you need healthy bacteria for proper digestion and absorption of nutrients, prolonged use of antibiotics also impacts bioavailability. Some vitamins and minerals are better absorbed when they are consumed along with other nutrients. This is why there is such a strong emphasis on eating a well-balanced, colourful diet that comprises of all the vitamins, minerals and phytochemicals. You need vitamin C to help absorb iron and magnesium to properly use vitamin D. On the other hand, zinc and iron should be taken separately as zinc is known to inhibit the absorption of iron. Other factors that affect bioavailability include use of alcohol and caffeine, liver health and whether the nutrient is water soluble or fat soluble. It also depends on how your supplement or drug is formulated, whether it is time-released, sublingual, liquid, pill, powder or liposomal. 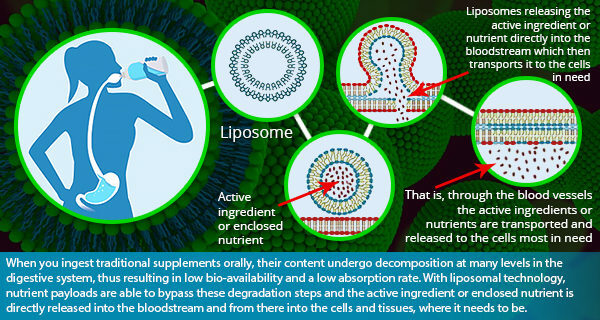 Liposomal supplements have an edge over traditional forms of supplements in terms of how easily they are absorbed and used by your cells. Why traditional oral supplements have poor bioavailability? When you take regular supplements through the mouth, a substantial amount of active ingredients is broken-down during the process of digestion. The acidic environment in the stomach, digestive enzymes and intestinal microbes decompose the nutrients. As a result, only a small fraction of the total nutrients you have ingested becomes available for your cells to absorb and use. In addition, some supplements, when taken in large doses or for prolonged duration, may cause digestive problems such as bloating, pain in the abdomen and diarrhoea. This can be challenging as emerging evidence suggest that certain vitamins, such as vitamin C, should be taken in higher amounts (than recommended daily dosage) if, for example, you are looking to leverage its benefits for heart health. Liposomes form a barrier around the cargo of nutrients it carries. This barrier protects the encapsulated substances from being broken down by the harsh chemical and biological environment of the gastrointestinal tract. Liposomes also protect the nutrients from the oxidative damage caused by free radicals. Most importantly, this protective shield remains intact until the payload of nutrients is delivered to the cells. Liposomes are made of the same type of fats that your cell membranes are composed of – making these nanospheres compatible with biological membranes. This allows them to easily penetrate the membrane barrier, without using large amounts of energy. Some vitamins, such as vitamin C, are water soluble and not very effective in penetrating the cell membranes which are basically made of lipids or fats. On the other hand, nutrients like CoQ10 are fat soluble. The good thing about liposomes is that they contain both water-loving and water-repelling compartments and are therefore extremely useful in ferrying both fat-soluble and water-soluble nutrients. Standard supplements are associated with gastrointestinal (GI) distress, especially when taken in high doses. Liposomal formulations by-pass the GI route, and thus pose no such risks. Liposomes are not limited to delivering nutrients and antioxidants such as vitamin C, glutathione, magnesium, curcumin and glutathione to increase their absorption and bioavailability. Clinical trials show that liposomal delivery systems can be successfully used to deliver anti-cancer drugs, antibiotics, anti-fungal medicines, anaesthetics and anti-inflammatory drugs. Article by Kel Stuart, Founder, of SANUS-Q which provides a range of natural, non-GMO and non-Soy supplements and vitamins in Liposomal liquid form, along with organically grown herbal products. Kel’s journey to developing these supplements began 50 years ago when he contracted Japanese encephalitis and left hospital as a 5-year old who would probably, according to the physician, live the rest of his life in a vegetative state. Find out more about SANUS-q including further contact details via the Healthy Life Essex directory entry.